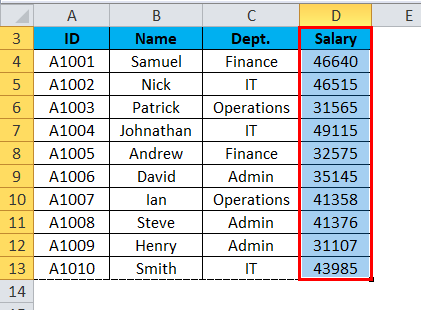 Print Area in Excel (Example) | How to Set Excel Print Area? How to Set a Print Area in Excel? We have observed many times while printing an excel sheet, it prints the whole page. But what if we want to print some specific information about the page rather than the whole page. Excel provides the solution of this which is called the Print Area. This is an in-built feature of Microsoft Excel. This feature is very useful if you want to present only some part of a report. A print area is the collection of one or more range of cells that you define for printing rather than the entire sheet. After fixing any area as a print area, it will print only that area while printing. 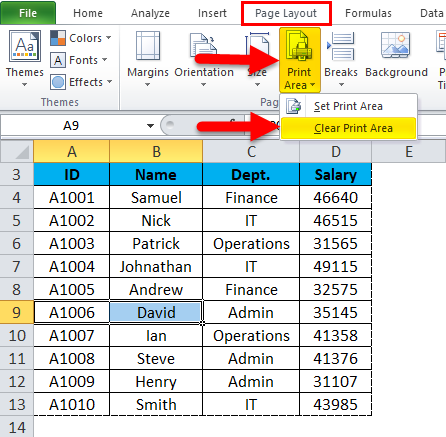 The range of cells selected in the print area can be contiguous or non-contiguous. It is very simple and easy. Let’s understand the working of the print area with some examples. We have given some employee data and we want to print whole data excluding the Salary of the employee. 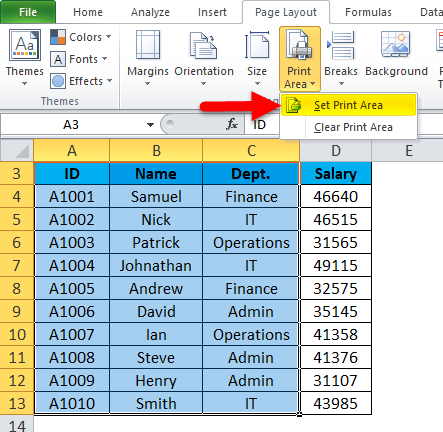 Select the range of cells that you want to print or set as the print area in that worksheet. Refer below screenshot. Click on Print Area option under Page Setup section as shown in the below screenshot. Click on Set Print Area option as shown in the below screenshot. 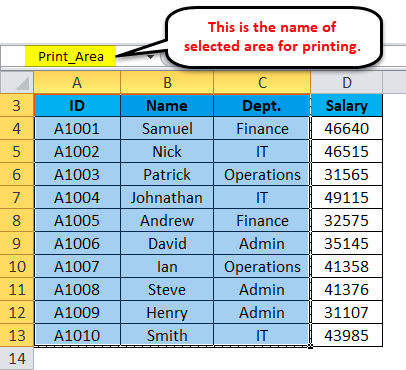 This option would set the selected range of cells or area as Print Area and also it gives the name of that area under Name Box. Refer below screenshot. You also can change the name of the Print Area as required. Now when you will give the print command, only the set print area will be printed. 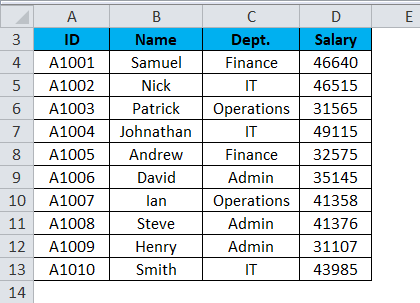 How to Make changes in the Print Area in Excel? 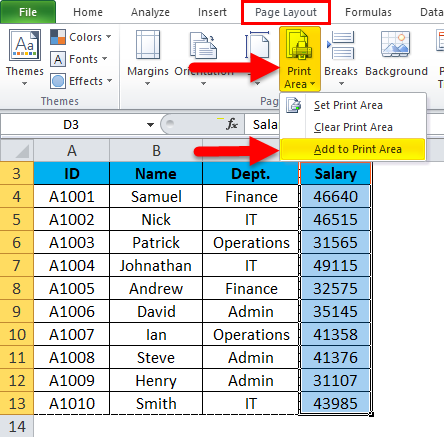 If you have already set the print area but after some time you realize that you need to include more data in the report then you need to make some changes in the setting of the print area. Suppose in the above example, we want to include the Salary field. Select the cells that you want to add in the already set print area. Refer below screenshot. Click on Print Area under Page Setup section. Refer below screenshot. Choose the Add to Print Area option as shown in the below screenshot. And this would add that selected range of cells in the Print Area. How to Remove/clear the Print Area in Excel? 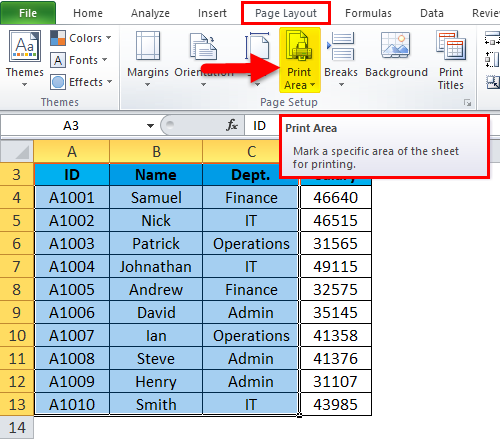 Click on any cell in the worksheet in which you want to clear the print area. Click on Print Area under Page setup section. Click on Clear Print Area from the list as shown in the below screenshot. These steps will clear all the print areas from the worksheet. 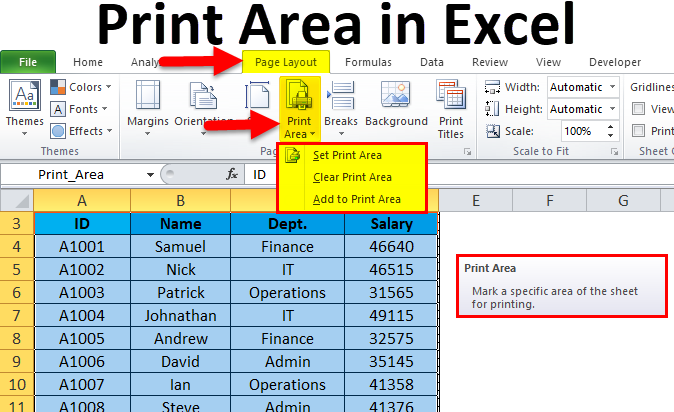 You can define more than one print areas in the worksheet by providing the different name to that area. Those areas will print separately. When you save the workbook, it saves the Print area as well. 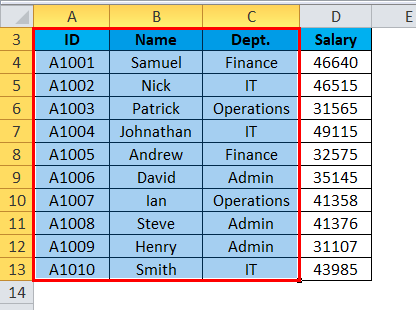 While adding more area under print area, and if those cells or area is adjacent to the existing print area, then it would be merged and print along with. If that new area is non-adjacent to the existing print area, then it would create a new print area and will print on the different page.